Bedroom remodels are a winning prospect in so many ways. For one, they're loads of fun to do. Unlike kitchens or baths, bedrooms require very little complicated, invasive work. Bedrooms are mostly about aesthetics and feeling: color schemes, painting, window treatments, and flooring. The other great thing is that bedroom remodels can be a positive return on your investment. Expanding upward or outward to build a new addition or bedroom often represents a low net return because your initial investment is so high. But rehabbing and redecorating an existing space is vastly cheaper and faster to accomplish. We think you'll love these bedroom remodel ideas! All are designed to pay off in the short-term with their beauty and utility, plus pay off financially when it comes time to sell your home. Carving out property to expand your home's footprint is always outrageously expensive, since a new foundation, walls, roofing, and a host of other elements are required. Turning your existing bedroom into a master bedroom is a far less expensive project, but is one that can pay you back handsomely. Catherine and Bryan Williamson are the husband-and-wife design team behind the popular blog Beginning in the Middle. 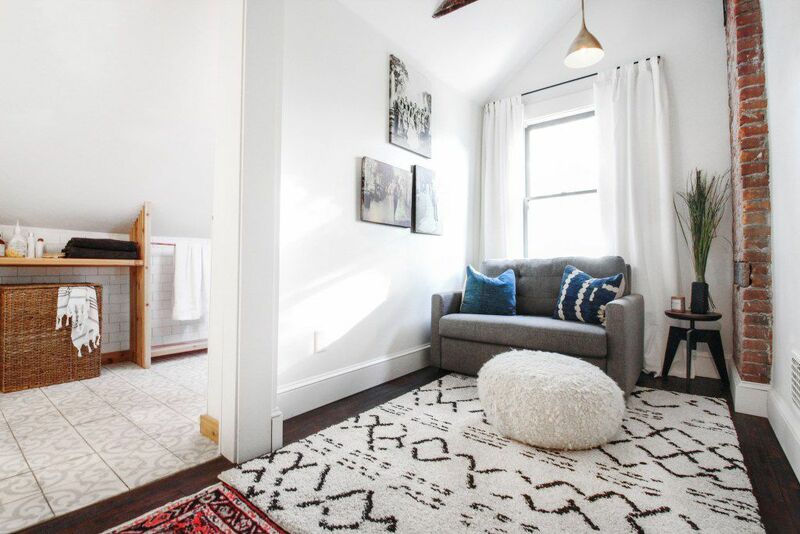 They created a master suite without laying down a single square foot of foundation by merging two bedrooms and a hallway into one, large area. The result is a gorgeous top-floor living-sleeping area that is bathed in light during the day, remote and cozy at night. Most homeowners focus their attention on kitchen lighting or bathroom lighting. Bedroom lighting often falls to the wayside, but it's more than just a ceiling light and a lamp on the nightstand. Think in terms of a combination of light sources. Start with the ceiling light and replace the old shade with a fun, eye-catching new shade. Or grace your high bedroom ceiling with a chandelier or an oversized shade. Rewire the wall behind the bed for space-saving sconces, perfect for reading in bed. Contemporary style bedrooms look fantastic with retro track lighting. ​Track lighting is flexible, allowing you to slide the fixtures down the track as well as swivel them to the perfect position. Bedroom flooring should communicate a sense of warmth, safety, and coziness. Hard flooring options such as ceramic tile or vinyl plank are recommended only in areas that experience high humidity and moisture. Otherwise, think in terms of soft floors that are friendly to bare feet, such as wall-to-wall carpeting or an area rug over wood or laminate flooring. Engineered wood flooring, a hybrid of dimensionally stable plywood and a hardwood veneer, can be installed with feet-soothing radiant heat coils underneath. Wide plank flooring, available in solid hardwood, engineered wood, and laminate, adds an air of dramatic grandeur to any master bedroom. Quality bedroom flooring sets the tone for relaxing evenings in bed, followed by deep, restful sleep. Home buyers place a high premium on good bedroom flooring. Do you want your bedroom to have character? Overtly themed bedrooms are for children, but bedrooms with nuanced personality turn heads and turn the room from a sleeping-only zone to a destination. Creating a tropical bedroom can be as easy as buying a canopy bed, adding bamboo window shades, and adding a ceiling fan. For a sophisticated look, keep it simple with plants and pillow accents, like this clean, beautiful themed bedroom featured by Bri Emery at the blog Design Love Fest. Other popular bedroom styles to try include shabby chic, Tuscan, Hollywood Regency, and contemporary. Following color trends can be frustrating since they don't always match colors that you love. For a newly purchased home or a home that you don't expect to sell for a couple of years, paint your bedroom interior any color that speaks to your heart. But for an upcoming sale, consider following the latest color trends when painting your bedroom. It's an easy, low-cost project that will take only a day or two to complete. If following color trends doesn't suit you, aim for darker, more relaxing colors in large bedrooms. Small bedrooms benefit from space-making light color schemes that use pastels, grays, or neutrals–just like blogger Anita Yokota did in her master bedroom. 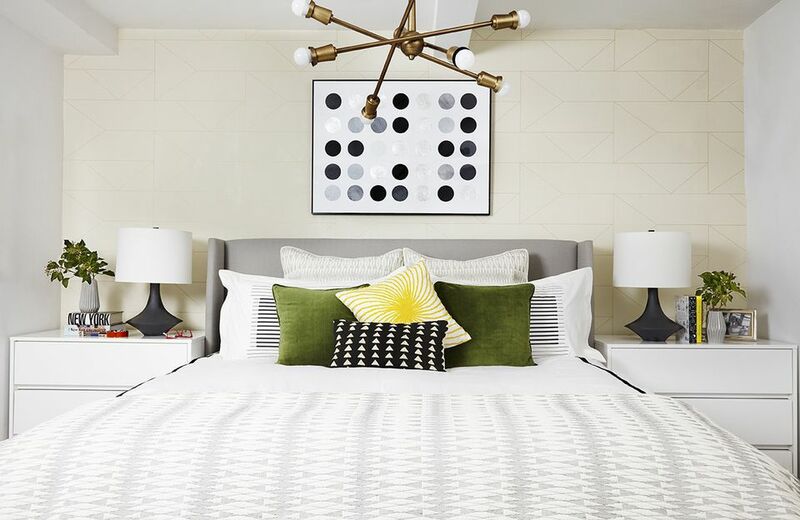 Ripping off the wallpaper her husband disliked so much, she repainted the room a light neutral tone and updated her accessories–resulting in a minimalist scandi-inspired bedroom that can easily transition to any style with its new wall color.